I wanted my kids to establish their own private devotion time at an early age. As soon as they started reading I had them read a children's bible. The one they started with had just a couple of senteces from common bible stories, a picture and one question about what they read. My kids have alwasy gone to church and we have family devotions every day, so they knew most of the stories and answers even if they sounded out the story so slowly they didn't really understand what they read. After they finished that little bible they each got their own "real bible". They started out just reading a couple of verses at a time and eventually they will read the entire bible. I know they didn't understand a lot of what they read, I just wanted them to make a habit out of reading their bible everyday. 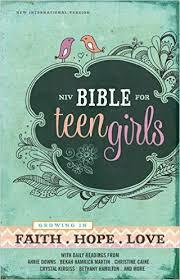 We just recently received the NIV Bible for Teen Girls and with two teen girls and one preteen girl in the house it is perfect timing. This hardcover Bible has a very pretty cover and was designed for girls ages 13-18. There is an introduction to each book of the Bible, character profiles, and promises of God are highlighted. There are sections called Growing in Faith, Hope, Love throughout the Bible. These readings were written by Christian female authors to help teen girls discover God's will for their life. Some of the authors are Bethany Hamilton, Annie Downs, Christine Caine, Nicole Weider, Elsa Kok Colopy, Crystal Kirgis, and more. The added readings in the Growing in Faith, Hope, Love sections are topics that teen girls are faced with today. They take the topic and show Bible verses where God tells us what he thinks of them or they take Bible verses and show the girls how to adapt them to their own lives. This Bible is a great addition to any household with teen girls. I have an additional copy of the NIV Bible for Teen Girls to giveaway. There are so many great women, but I think my favorite is Esther. I am not sure because I haven't read the bible fully. Esther is my favorite Thanks! My favorite is Deborah... My name is Melissa which is a derivative of Deborah. My favorite woman from the Bible is Esther, but it is hard to pick! Mary is my favorite woman from the bible...such strength.